More often spotted at the side of the catwalks of Paris fashion week than the dance floor, Pascal Therme tried his hand at the Weather Festival for our magazine in 2014. This year, he put his skills as a portraitist and reporter on show once again with these glowing photos, full of smiles and colour. Rødhåd, Lazare Hoche, MCDE, the Camion Bazar and of course you the readers, you are all in Pascal Therme's gallery. After its excursion to the bois de Vincennes last year, the Weather Festival, Surpr!ze's (the team behind Paris' Concrete club) annual event, came back for a greatly successful fourth edition from 3 to 5 June. For the occasion, it made its return to the famous tarmac and model Ariane rockets of the Bourget aeroport that left such a mark on festivalgoers in 2014. 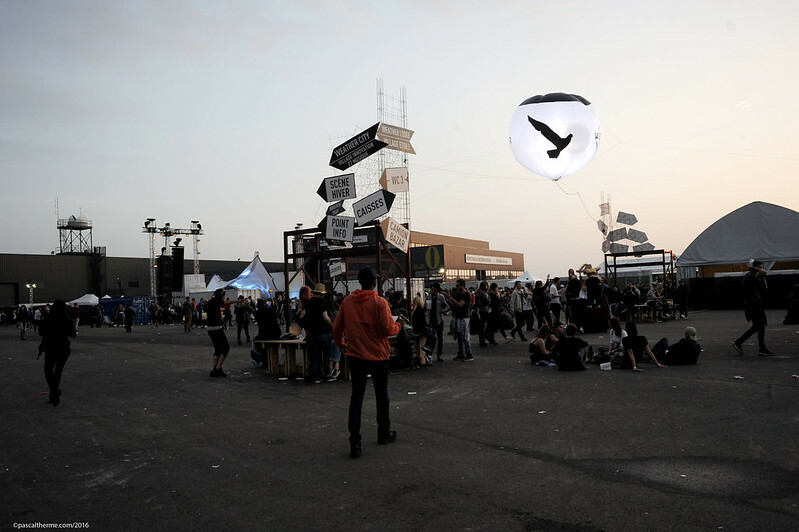 For one weekend, the Paris aerodrome shook under the bass and stomping feet of almost 50000 seasoned dancers, determined to cover every corner of the four stages spread outside and under two immense hangars turned musical playgrounds. Many sets will be remembered for a long time to come: notably the particularly powerful selections of Len Faki, and those of Rødhåd and The Black Madonna – who each appeared on our latest covers. And the closing set, handled by Richie Hawtin, who worked his new mixer at the same time as the huge crowd before him, who did well to stay at the Bourget mere hours before the start of a whole new working week on Monday. The Camion Bazar crowd was well worth seeing too, staying faithful to the post and smiling in the sunshine all Sunday long, under rainbow decorations and the coolest of electronic music. The fourth Weather festival showed its exceptionally high standards – the Hessle Audio B2B2B special between Pearson Sound, Ben UFO and Pangaea; and the one between Donato Dozzy and Nuel – a perfectly warm welcome, and to finish, the immortal image of Ricardo Villalobos, arms stretched towards the sky. Big names, hidden gems, a showcase of local talent, a stunning light-show and a crowd overflowing with energy... With its fourth edition, the Weather festival converted on all of its efforts and put Paris at the top of all French summer festival destinations. For the occasion, we sent along our man Pascal Therme, who had been there two years ago on the same site. The photographer we know from the catwalks of high fashion was instead there to capture the best moments of the festival, and its beautiful faces. Perhaps you're among them.